Edward S Curtis art is focused on Native Americans from the United States. Edward S. Curtis’ iconic photograph of Chief Joseph of the Nez Perce introduced America to a brave chief who led his people during a time of great upheaval for Native Americans. 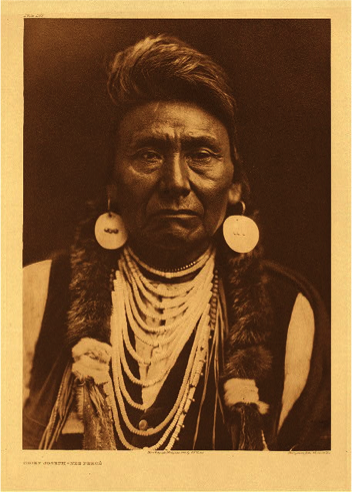 Initially, there was a tenuous peace between the Nez Perce and the U.S. government; however, the relationship disintegrated when gold was discovered on Nez Perce lands and the government took back millions of acres promised to the tribe. Tensions grew to a boiling point in 1877. At that time, Chief Joseph had assumed a leadership role from his father, Joseph the Elder, and he agreed with the other chiefs that the government’s deal was unfair. During this time of turmoil, Nez Perce warriors killed several white settlers. The tribe was forced to retreat and Chief Joseph attempted to lead them to Canada under the pursuit of U.S. troops. They were decimated by fighting, starvation, and harsh weather on their trek north to the border; the Chief could not bear to see them suffer. In October 1877, stopping forty miles short of Canada, in Montana, Chief Joseph surrendered and promised famously, “to fight no more forever.” The surviving members of his tribe were sent to reservations across the west, never to return to their ancestral home in Oregon. A century after his death, Chief Joseph remains a well-known American figure. We stumbled across this story in an article in The Seattle Times, which you can access here. Over 100 years ago, a Portland boy, Erskine Wood, asked Chief Joseph if there was anything his father, Charles Erskine Scott Wood, could do for him. The Chief replied that he was in need of a stallion to improve his pony herd. The father had, 15 years before, been among the troops that pursued the Nez Perce into Canada. The boy was sensitive to this history and, thinking that his father would rather return to the Chief his ancestral homeland, unfortunately never relayed this practical request. The decades passed and Erskine lay on his death bed at age 104. He felt so troubled by the unfulfilled promise that he told his granddaughter that it was his major regret in his life. If you have any questions about Edward S Curtis art, or about any of our other featured artists, don’t hesitate to contact us today. We will get in touch with you as soon as possible, and feel free to drop by our gallery as well.